Today, 21st October 2015 is a very special day for me. And why it should not be? Afterall, it is the 1st Birthday of my love, my passion, my dreams and the one which will help me make more friends, fulfill all my necessities, bring recognition and much more, ClicksToRemember. The whole idea started in March-April 2014 during a casual interaction with a friend. He suggested having my own website where I can display my recent work/portfolio to people. This can help me promote my work a lot better and hopefully, earn some more money. I had no idea that, that interaction will change the course of my life. Yes, I loved photography. I had passion for it. People appreciated my work and photography skills. Many of them cited the example of *Farhaan of 3 Idiots* to inspire me. But, no way I was going to take it as a full-time profession. After all, I had studied/worked at 4 of the most prestigious institutions of the country – Vellore Institute of Technology, All India Institute of Medical Science, The Indian Institute of Science and National Centre for Biological Sciences. These are the institutes people dream of visiting at least once in their lifetime, forget about being part of any one of them. Okay, maybe I am exaggerating. But, this is indeed true. How can I even think of leaving such a wonderful past, lovely people, brilliant minds around and enter the world of photography? I have commitments to fulfill and promises to make. To myself, my family members and most importantly, to my supervisor. I just cannot leave everything and live in my own world. The world of photography. So, I chose to be a person who will try to learn “how to make balance between work-life and passion”. I started ClicksToRemember while still working for my Ph.D. and I believe I made the right decision. The decision that will change my life and, I know, for good. Okay, so we have the name now. What next? The website. Who will develop it? That’s a big question. One of my close friends told me that he will develop the website for me and give it as a “gift”. Wow! I said. But, it was not agreeable to me. How can I have the website for free when he will have to put so much time and efforts into it. Heart conflicting Mind. And I decided to develop it all by myself. I feel it was a great decision that I took. Not only did I learn website development, I also learnt Search Engine Optimization (SEO), Content Marketing, Social Media Marketing and Email Marketing. Wow! Somuch of learning, in a year. Finally, I launched the website on 21st October, 2014. It was a great period of learning, through struggles, during the first year. Everything about running the business and maintaining the website was new to me. Every now and then, I sought suggestions from my close friends and relatives about how I can improve upon my work, website and interaction with visitors. I put up a total of 25 blog posts last year. That’s a fairly decent number, considering it is only the first year. These blog posts belonged to different genres of photography like nature photography, travel photography, candid wedding photography, couples photography, portrait portfolio, hotel photography, event photography and kids photography. I included a page “Questions?” on my website where I helped several people with their photography related queries such as “Which camera/lens should I buy?” and “I want to buy a zoom lens, which one should I buy?” etc. I used content, email and social media marketing to convert the visitors into my clients. I then tried to maintain a healthy and life long relationship with them by connecting through various social networks and through informal/personal interactions. During the first year, ClicksToRemember saw a total of 10,783 visitors with a total of 36,680 page views. That means, on an average, a visitor had about 3.40 page views before leaving the website. The average time on site for each visitor was about 1 minute 37 seconds. 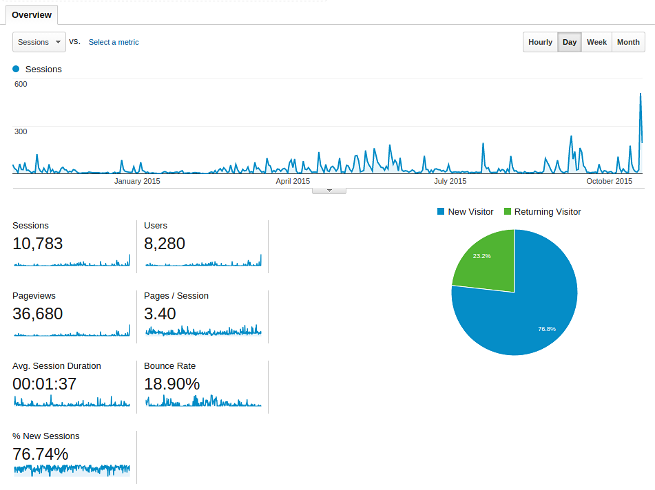 Not bad, considering it’s the first year and the content of my website will only improve with time. I am happy that the average bounce rate (percentage of people leaving my website immediately or within first 10 seconds without interacting with it) for my website was very low i.e. 18.90%. This number is usually high (40%-70%) for most websites. 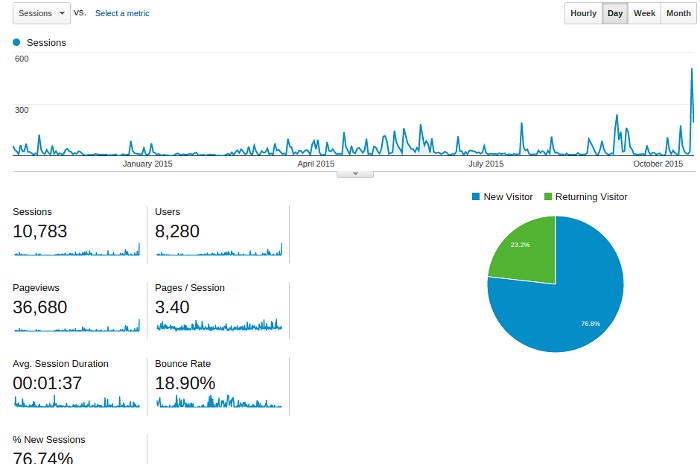 I am not very happy with the total number of visitors (~11K) that visited my website in last one year but I will take it, as I did not work very seriously on content promotion. Time constraints and working for my Ph.D. projects was the main reason for this. 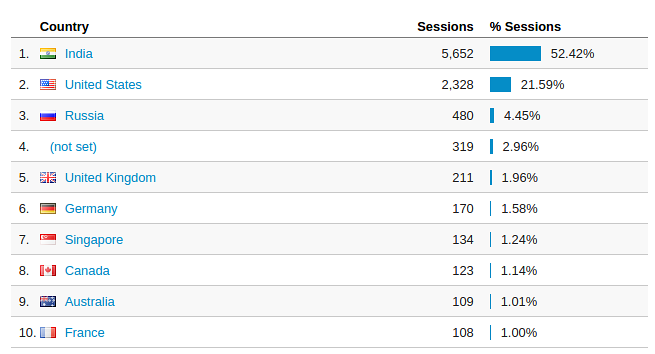 What was surprising to me was that only about half (52.42% to be precise) of my visitors belonged to India. Rest half of the visitors belonged to foreign countries. Almost 25% of my traffic (~22%) came from USA. Courtesy to Facebook and my friends living over there. 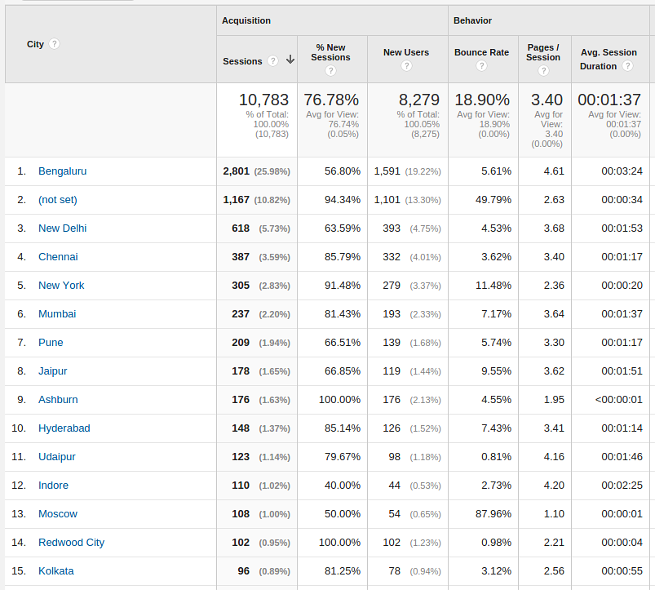 I received maximum number of visitors (~25%) from Bangalore. This is expected, as I live here and so do most of my friends. I am largely connected with all of them through Facebook. Other metro cities like New Delhi, Chennai, New York and Mumbai comes next in this list. It is shocking for me that my native city, Udaipur, is not among the top 10 cities. In fact, it’s place is 11th in this list. 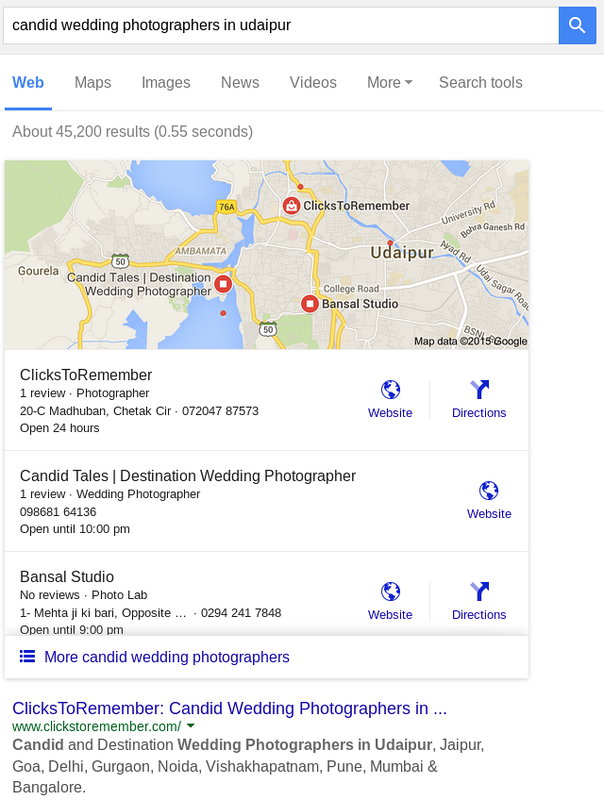 One important reason for this shocking news is that I am receiving less number of visitors from Udaipur even when my website is ranking #1 for the keyword “candid wedding photographers in Udaipur”. Every single client helps in the growth of the individual and the company. During this period I happened to work with so many clients and that too on different genres of photography. I worked with StayZilla, an online portal for hotel bookings in India and abroad, and did photography for more than 350 hotels in Udaipur, Mt.Abu and Bangalore, combined. I worked as an official photographer for three of the traditional weddings in Udaipur and Indore, along with one post-wedding photoshoot. I also worked on two separate projects where I captured architectural details of International Centre for Theoretical Sciences (ICTS) in Bangalore and Hotel Horizon in Udaipur. The photos will be used for their individual websites. I also did couple of portfolio photoshoots and one where I photographed a cute little kid. I did nature photography and travel photography. I captured portraits of construction workers and young children at a government school in Bangalore. I also captured several events that were organized at NCBS, the institute where I am currently pursuing my Ph.D. I also bought “photoshop action presets” from Zafizack so that I can speed up my editing process and provide some really wonderful photographs to my clients. The year also brought some disappointments, time and again. Mostly, the times, when I failed to convert a lead into my customer. I am trying to figure out the reasons for the same and learning from my mistakes. Also, I am trying to come up with a more reasonable pricing for my services. There were some projects where I hired some fantastic young photographers for my help. Otherwise, mostly it was a one man show. The photographs that you see on my website have all been taken exclusively by me. Overall, it was a great year, both financially as well as learning wise, for me. I increased the number of equipments from 1 camera and two lenses to 2 camera and 7 lenses. I also bought key accessories like external flash and a tripod. These gears will help me serve my future clients in a much better way. In the 2nd year, I plan to update my blog at more or less the same pace (Courtesy to my Ph.D. commitments). However, I plan to promote my work in a much effective manner so that I receive more visitors. I will try to convert these visitors into subscribers (content marketing), who will potentially become my clients (content + email + social media marketing) and ultimately my friends (personal interactions). I also plan to include talented photographers, videographers, graphic designers and professional editors in my team. This is to achieve long term goals. I thank all the people who guided and supported me throughout the year. I also thank the photographers who worked with me on various projects. As my precious reader, I want to thank you for all your support, love and blessings. Without you, this journey would not have been possible and without your encouragement I cannot move ahead any further. I am sure you will extent your support and affection in future as well. Do you have a passion for something? Do you plan to live your dream? When and how are you going to do so? Please share it with me. I will be very happy to hear from you and help you out in the best possible manner I can. The celebration of 1st Birthday of ClicksToRemember. Review of the first year, sharing of good and bad experiences, capturing memories of our beloved customers and what to for in our next year(s).